In a recent study published in Science, researchers at ICFO – The Institute of Photonic Sciences in Barcelona, Spain, along with other members of the Graphene Flagship, reached the ultimate level of light confinement. They have been able to confine light down to a space one atom, the smallest possible. This will pave the way to ultra-small optical switches, detectors and sensors. Light can function as an ultra-fast communication channel, for example between different sections of a computer chip, but it can also be used for ultra-sensitive sensors or on-chip nanoscale lasers. There is currently much research into how to further shrink devices that control and guide light. New techniques searching for ways to confine light into extremely tiny spaces, much smaller than current ones, have been on the rise. Researchers had previously found that metals can compress light below the wavelength-scale (diffraction limit), but more confinement would always come at the cost of more energy loss. This fundamental issue has now been overcome. "Graphene keeps surprising us: nobody thought that confining light to the one-atom limit would be possible. It will open a completely new set of applications, such as optical communications and sensing at a scale below one nanometer," said ICREA Professor Frank Koppens at ICFO – The Institute of Photonic Sciences in Barcelona, Spain, who led the research. This team of researchers including those from ICFO (Spain), University of Minho (Portugal) and MIT (USA) used stacks of two-dimensional materials, called heterostructures, to build up a new nano-optical device. 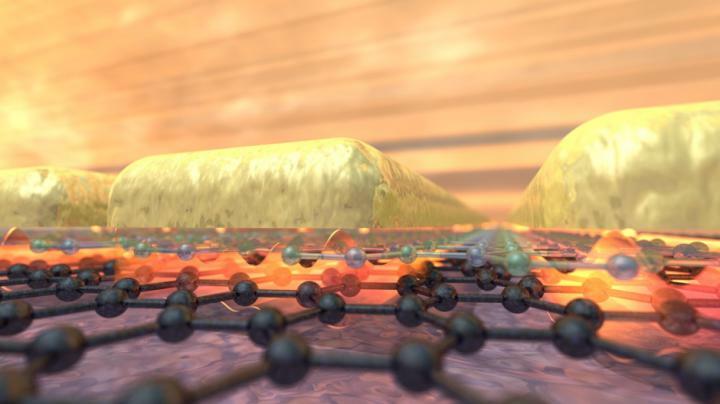 They took a graphene monolayer (which acts as a semi-metal), and stacked onto it a hexagonal boron nitride (hBN) monolayer (an insulator), and on top of this deposited an array of metallic rods. They used graphene because it can guide light in the form of plasmons, which are oscillations of the electrons, interacting strongly with light. "At first we were looking for a new way to excite graphene plasmons. On the way, we found that the confinement was stronger than before and the additional losses minimal. So we decided to go to the one atom limit with surprising results," said David Alcaraz Iranzo, the lead author from ICFO. By sending infra-red light through their devices, the researchers observed how the plasmons propagated in between the metal and the graphene. To reach the smallest space conceivable, they decided to reduce the gap between the metal and graphene as much as possible to see if the confinement of light remained efficient, i.e. without additional energy losses. Strikingly, they saw that even when a monolayer of hBN was used as a spacer, the plasmons were still excited, and could propagate freely while being confined to a channel of just one atom thick. They managed to switch this plasmon propagation on and off, simply by applying an electrical voltage, demonstrating the control of light guided in channels smaller than one nanometer. This enables new opto-electronic devices that are just one nanometer thick, such as ultra-small optical switches, detectors and sensors. Due to the paradigm shift in optical field confinement, extreme light-matter interactions can now be explored that were not accessible before. The atom-scale toolbox of two-dimensional materials has now also proven applicable for many types of new devices where both light and electrons can be controlled even down to the scale of a nanometer. Professor Andrea C. Ferrari, Science and Technology Officer of the Graphene Flagship, and Chair of its Management Panel, added "While the flagship is driving the development of novel applications, in particular in the field of photonics and optoelectronics, we do not lose sight of fundamental research. The impressive results reported in this paper are a testimony to the relevance for cutting edge science of the Flagship work. Having reached the ultimate limit of light confinement could lead to new devices with unprecedented small dimensions."